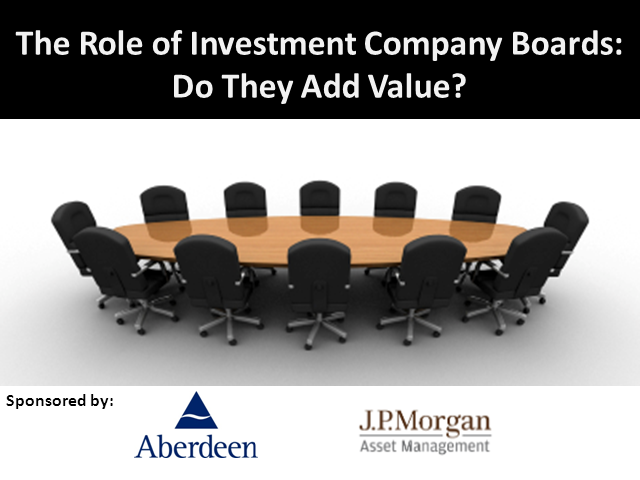 The Role of Investment Company Boards: Do They Add Value? In this session, we’ll discuss the challenges faced by an investment company board, particularly in the current environment, and the ever-increasing burden upon non-executive directors as stewards of shareholder capital. We’ll also look at why their role gives the fund a distinct advantage over its open-end counterparts and the different ways in which they can add value for shareholders. Title: The Role of Investment Company Boards: Do They Add Value?